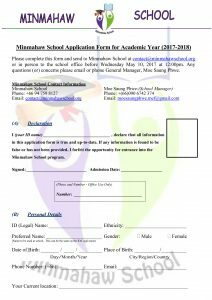 If you are interested to apply Minmahaw School (2017-2018) academic year, Please read the school academic application form. The extrance exam will held on May 13th 2017 at 9 :00 AM in Minmahaw School. Applicants must have turned 17, and be not older than 23, by 1st June, 2017. Application Forms must be delivered by email or in person to Minmahaw School Office by durin the exam.